B2B appointment setting is very similar. It seems easy at first glance. However, if misjudge the task as easy, then you will most certainly be disappointed. 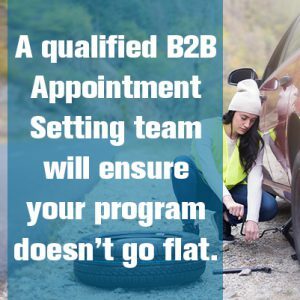 At Quality Contact Solutions we are experts at B2B appointment setting and here are a few items you’ll need to keep in mind to make sure your B2B appointment setting program doesn’t go flat. Lists – Great b2b appointment setting starts here. Invest substantial time and money into selecting the right demographic target your team will be calling. Anyone who isn’t your target audience is a waste of time and money. How are you scheduling the appointment (CRM or data capture through a dialer)? How are the agents viewing open times on the sales team’s calendar? Are you sending an invite to the prospect and what system are you using for this? Do you have a reminder system set-up to reduce No Show rates? How are you handling Inbound calls? What is your Caller ID strategy? Experienced b2b appointment setting agents and managers with a track record of success. QCS has been doing b2b appointment setting for many years and we have become experts in what it takes to provide high-quality b2b appointments. Whether you are looking to increase appointment volume, quality or are starting a new b2b appointment setting campaign, give us a call at 1-800-963-2889 and press 1 for sales. Or email me at [email protected] We’d love to help!